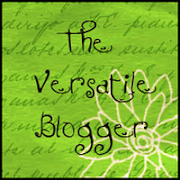 I read a lot of blogs about monthly or weekly favourites and I can't say that I introduce that many new products into my routine to be able to blog about them on a regular basis. 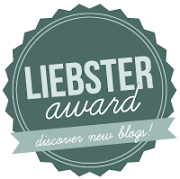 So I thought every now and then I would do a blog about products that stand-out for me or have made their way into my routine without me really noticing but suddenly I realise I am reaching for them more and more. 1. NUXE Oil - I was introduced to this through bellabox a monthly beauty box I subscribe too, you can find out more about them here. I love this oil, I use it to moisturise my face, body, hair, nails and occasionally as a very light perfume. There is nothing this oil can't be used for, add a little salt or sugar for an exfoliate or as an all over body massage oil. I use this as an oil cleanser on my son's face to help control his acne, I massage a little on his face and it helps loosen and clears his pores. I prefer the spray bottle it's less messy and one spray in the palm of my hand does my face and neck or my hair, a little goes a long way. 2. 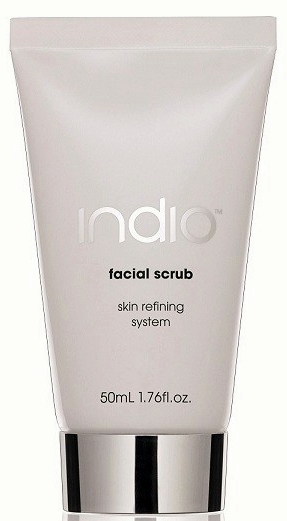 INDIO Salt Scrub - This is another amazing product introduced to me through bellabox I have been looking for a very fine scrub that doesn't strip my dry skin of what moisture it does have while gently exfoliating my face and NOT causing break outs. This scrub is wonderful, does a fantastic job of exfoliating and leaves me with soft clean skin with no redness or irritations. You only need a pea sized amount for your face and it moisturises as it exfoliates. Contains Dead Sea Salt and Herbal extracts, leaves my skin looking soft and hydrated, I use it once a week. 3. 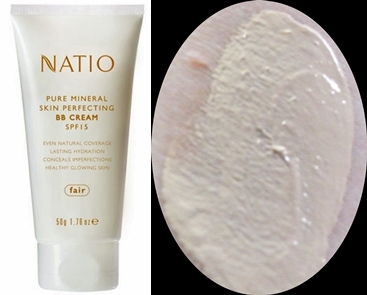 NATIO BB cream, FAIR - Ok I am starting to see a pattern emerging here, this is another product which was introduced via bellabox I swear I am not doing this on purpose but I guess when you subscribe to beauty boxes that's where you will find the majority of your new favourites. I am a real BB cream snob and prefer the Asian BB creams over the western formulations BUT... out of ALL the western BB creams I have tried NATIO make THE best BB cream for me and I am already on my second tube. This BB cream hydrates, offers good coverage, SPF15 protection, the Green Tea and Chamomile soothes redness while the Vitamin E repairs and the Shea butter and Jojoba oil moisturise. Has that great natural NATIO aroma and I just love the way it feels on my skin and the natural skin coverage I achieve for my every day look. I also notice as I am outdoors a lot that the SPF in this cream offers very real protection and my face is not red by the end of the day. 4. MUA Pro's Every Lash Volume and Lengthening Mascara - Black - this is one of those little gems that you don't expect much from because of the price and it becomes your HG of mascaras. This is the only mascara I have been using for weeks now, it sat at the bottom of my trial box ignored for the longest time and now it's the mascara I reach for when I want perfect lashes EVERY time. The brush on this is amazing, it separates and coats every single lash even the little ones, no clumping, no fall out and NO panda eyes. If you haven't tried this mascara yet I urge you to get a tube, it is one of THE best mascaras I have EVER used. You can find it here. 5. Rimmel Glam Eyes - Smokey Quartz - This is the newest eye shadow I have purchased recently, it was half price at BigW and I have been using it pretty consistantly ever since. Gorgeous, silky formula with just the right amount of sheen, multi-dimensional shade means you can wear it on its own and the depth of colour appears different depending on the lighting. 6. 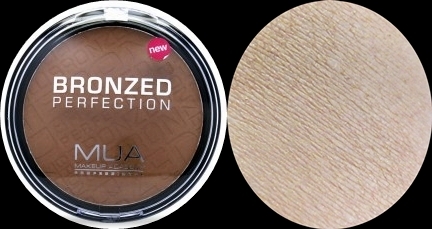 MUA Bronzed Perfection, I would have to say this is THE best bronzer I have ever come across and even though I try others I ALWAYS come back to this one. Perfect for contouring my face, adds just the right amount of colour and shadow, the shade is buildable. NO glitter, that is very important to me, you can find it here. 7. 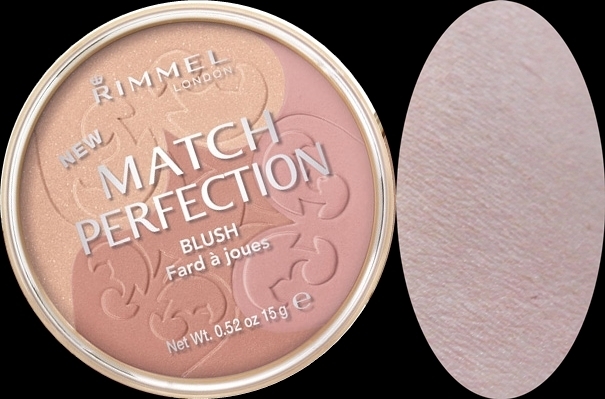 Rimmel - Match Perfection Blush - Fair. Creates a natural flush on the cheeks, the separate shades can be used for deeper colour and contouring or you can sweep you brush over the entire palette. This is THE perfect blush for my fair skin and I have never found one better. 8. Yes to Carrots C Me Blush Lip Tint - Coral Sunshine ~ Natural Smile ~ Cotton Candy. Sorry no swatches, these tints are so sheer they don't show up on my camera. Super moisturising, with a hint of colour, great to just throw in you handbag. 9. AUSTRALIS Ready Set Go Finishing Powder - superfine, translucent silica powder. This is the best powder for setting your foundation without drying your skin out and leaving it looking powdery. Since I discovered this powder I haven't used anything else. Perfect! 10. Urban Rituelle Turkish Rose & Vanilla Perfume Oil - this is the perfect mix of Rose, Musk and Vanilla in a oil base roll-on bottle. Apply a little to your pulse points and the perfume lasts all day, this is one of my favourite perfumes and I carry it with me always. This perfume is part of Urban Rituelle,s Tea Ceremony range and you can find them here. Ok, that's my Top Ten for now, there are other products I use consistantly so this is just a snapshot of a few favourites and I am sure it will change when I find new products or rediscover some old favourites. Love to hear what some of your favourite products are, please comment below. Loving the swatches of the bronzer and the blush. Both very subtle - I'm sick of the ones where just a little goes a long way, because I always end up looking unnatural with those. I am so pale I need subtle otherwise I come off looking like Bobo the Clown. The blush and bronzer are buildable though, I put the blush on too dark once and had to go over it with translucent powder to lighten. It does give you a very natural flush. Give Indio a go I think you will like it. I've been wanting to try the Australis finishing powder! Have to finish using mine first before I decide. I still have my Natio bb cream sample that I haven't used yet but might decide to soon :) Nice favourites! Thanks Louise, interested to know what you think of the BB cream.